90 SMT Magazine • September 2016 tion trends for electronic packaging and assem- bly; they introduce a vast number of area array packages. The array packages initially only had hidden solder joints under the bottom area of the package; now the flip-chip die within pack- age also have hidden joints. The hidden joints—both at package and as- sembly levels—added significant challenges to the inspectability and certainty of assuring in- tegrity at the various microelectronics hierarchy levels. Another added complexity is the transi- tion to using only Pb-free solder alloys. Suppli- ers of electronics packages either have or will soon transition to using Pb-free alloys in order to enforce restrictions on hazardous substances (ROHS) for electronic systems. The solder joint appearance for the Pb-free solder alloys is dull rather than shiny, as it is for the tin-lead eutec- tic solder, which will add confusion even if vi- sual inspection is used inadvertently as a crite- rion for the quality of joint acceptance or rejec- tion of a Pb-free solder joint. Inspection of ball grid array (BGA) and col- umn grid array (CGA) package/assembly, espe- cially their flip-chip versions is challenging 1, 2, 3, 4, 5 . Nondestructive X-ray inspection became a new approach for ensuring the quality of area array packages and assemblies. 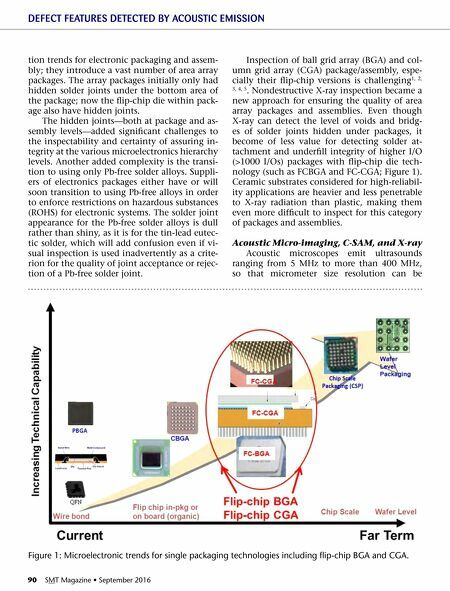 Even though X-ray can detect the level of voids and bridg- es of solder joints hidden under packages, it become of less value for detecting solder at- tachment and underfill integrity of higher I/O (>1000 I/Os) packages with flip-chip die tech- nology (such as FCBGA and FC-CGA; Figure 1). Ceramic substrates considered for high-reliabil- ity applications are heavier and less penetrable to X-ray radiation than plastic, making them even more difficult to inspect for this category of packages and assemblies. 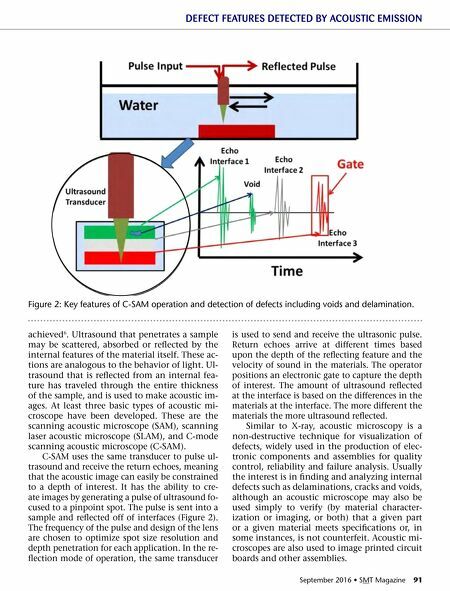 Acoustic Micro-imaging, C-SAM, and X-ray Acoustic microscopes emit ultrasounds ranging from 5 MHz to more than 400 MHz, so that micrometer size resolution can be DEFECT FEATURES DETECTED BY ACOUSTIC EMISSION Figure 1: Microelectronic trends for single packaging technologies including flip-chip BGA and CGA.